must be getting close to spring! Our koi have come out and are swimming around- possibly begging for food. It not quite warm enough yet, but I sure can't wait to spend evenings with these guys. Thanks for stopping by. I was so thrilled that my photo made the TT this week! Really just made what was a very sad week, a little brighter. Some very pretty Koi there, I only go as far as bog standard gold fish and black Comets in our pond! What fun to have all of those fish. It is interesting because we have some friends here in Arizona (desert) who have koi and their concern is the heat in the summer but they said they do just fine. 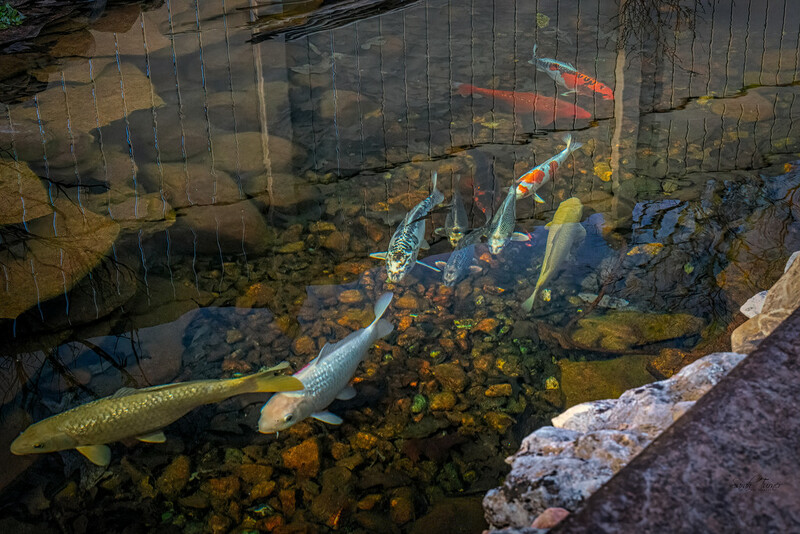 Do your koi sort of hibernate in the winter? Do you not feed them? What fun to have in your yard. They show up so nicely in this photo. Lovely colourful collection you have there. How wondercul to have all those beaitiful fish swimming around, lovely shot. Great capture. The water is so clear looking. They looks big and very clear focus for these underwater creatures. How wonderful to have these beautiful fish around to watch. You've captured quite a varity of shapes and colors. I like it a lot! fav.